Heat oil in a large soup pot over medium heat. Add shallots and cook until tender, about 2-3 minutes. Add carrots, sweet potatoes, stock, coriander, fennel, oregano and clementine peel. Bring to a boil, then reduce heat to low and cook until vegetables are tender, about 45 minutes. Remove orange peel, and puree soup in a blender, being sure to remove the stopper from the cover (otherwise, you might have an explosion of soup!). You can also use a food processor or immersion blender. Ladle soup into bowls. 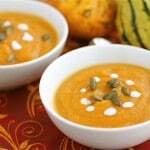 Add a drizzle of coconut milk and sprinkle some toasted pumpkin seeds on top before serving.